For over 30 years S&S Tire and Auto Repair has provided quality service to Surprise, Peoria and Goodyear Arizona. Specializing in everything that your vehicle rides on, S & S tire carries recognized and trusted brands for standard and performance tires like Michelin, BF Goodrich and Pirelli. Another cool thing I noticed is that S&S also provides tires for other uses as well, including lawn mowers, tractors and all terrain vehicles. After 43 years in business, it’s no surprise that Larry Harkers Auto Repair in Phoenix AZ is still going strong. Its a rare thing to see a business of any sort stand the test of time, let alone a maintenance garage of humble origins. But you know; if anyone was to pay attention they would notice that true longevity stems from sticking to your roots and maintaining the strong ethics on which you were founded. And as I get older, I often find myself muttering "they just don’t make em' like they used to". Regardless of the model and make of your vehicle, Larry Harker's Auto Repair can provide it with a full garage service. They will test and evaluate the problems of your car with their equipment. Many cars that are made today depend on the computers and sensors in their motors. Larry Harker's Auto Repair always makes sure they are up to date with their testing and repair equipment that they use to test and evaluate the computers and sensors in your car. This updates the technicians on methods of improving the life and efficiency of your car. The staff at Larry Harker's Auto Repair will gladly answer any questions you may have and let you know how regularly you have to bring your car in for maintenance. They will also inform you of any problems with your vehicle that may come up for attention which can be attended on another day. When you take your car in for its regular maintenance, their staff will inform you about how you can increase the life of your car and the best products to use for it. Larry Harker's Auto Repair staff aims to provide the best quality of customer service each time you call them. Anyone working will be happy to help answer your queries. Call today and you'll get questions answered by experts. 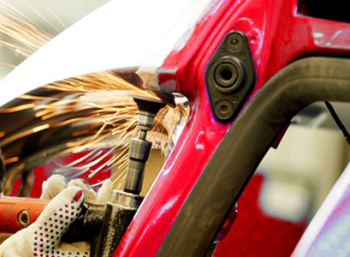 Campus Body Salon has been providing the valley with excellent collision repair services since 1973. With all the constant change and evolution, they strive to continue to educate their staff, both technical and office, to provide you with not only the very best repairs in terms of fit and finish, but more importantly in terms of safety. Campus Body Salon has worked hard over the many years to continue to have an excellent reputation with their clients, the community, and their insurance partners. They are proud of the fact that they are a direct repair facility for many major insurers and those relationships are not easy to secure. 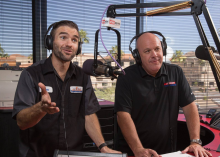 Leo Petruzzella of Campus Body Salon stops by the KTAR studio to join Matt and Dave on Bumper to Bumper Radio. The history of Campus Body Salon in Tempe. Information about the "Cash For Your Crash" program. What sets Campus Body Salon apart from other collision repair facilities. How to work alongside Campus Body Salon and your insurance provider after a crash. Campus Body Salon Customer Feedback. How Campus Body Salon will be an advocate for YOU following a collision. "Leo was great with communication and keeping me updated on my car. They did a great job and my car looks like new again. Thank you so much." "Todd was great with the updates, super easy to know what was going on, and also seemed like he expedited around my schedule which was just above and beyond." "I am so thankful for such wonderful service. You were very helpful every step of the way. Thank you for making a stressful situation so stress-free!" "Todd was very helpful during my repair. He called me with all updates and kept me informed." "The shop was AMAZING!!! Such kind employees that work there. The patients they have dealing with nervous customers like me, I wouldn’t be able to endure. I received my car in a timely manner, as well as I was noticed on everything was was being done each step of the way. The owner made a right decision in this investment." "Hands down this was the absolute best auto body shop experience. Todd provided exceptional customer service and communicated with me every step of the way. The work they provided was great and I highly recommend Campus Body Salon for any collision repair." "If I could give Campus Body Salon ten stars, I would. Not being in an accident for a long time I was unfamiliar with how the process would work. I met with Leo and I knew from the start I was in good hands. He coached me with regard to the insurance companies and the games they play. He handled everything very professionally and my car turned out great. Their attention to detail was exceptional and the paint match was right on. If you're particular about your car, you won't be disappointed with Campus Body Salon." "Todd had me taken care of today. I had been to this shop once in 2005 and their work was outstanding, so I came back when I found out someone had bumped me and dislodged the bumper from the clip assemblies. He took a look at it and said he'd take care of it, for nothing! I was floored. The job took 5 minutes and it looks like nothing ever happened. Shop shows appreciation of veterans. I've mentioned them to all my friends and family when they need things done right. Thanks Todd and Campus crew." Beware of the most inexpensive estimate. We all like to get a good deal. But how motivated should we be when it comes to searching for the least expensive estimate in regard to our vehicle repair? Here is the number one reason why the cheapest estimate is not always the best option. Outer appearance is one thing. But structural integrity and safety are another. When comparing estimates, be sure that the structural repairs are being addressed properly to insure a safe repair. Many items that appear as if they can be “banged out” compromise the integrity of the metal and therefore will not react correctly in the event that another collision is sustained. Lifetime Nationwide Warranty covers 100% of our paint work. The difference between a good repair facility and an excellent one is service. Campus Body Salon understands and appreciates that "their clients" are responsible for their success. Even the small jobs to them, can feel like a whole world of stress for you. They treat all jobs the same, big or small, and take care of everything they can for you. Their staff is trained to make your experience as hassle free as possible. Most people would agree, complex is not always the best way to describe something you're selling. Most scientists will agree that if the process is not complex enough the quality of the process is lost. Their product is a blend of 50-50 Art and Science, so complexity is important. Most people are only concerned with the end result, but if your interested Campus Body Salon has laid it all out for you here.